A friend of a friend needed a song for a movie that he is making. After he described to me what he had in mind, I gave him a CD with the advertisement record that Brabantia, a Dutch producer of kitchen utilities, had made in the late sixties. 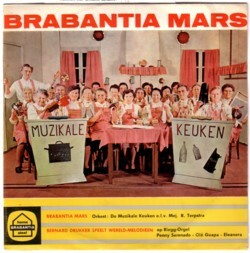 This is a great record: about 25 housewives with no musical background are laying a composition of Bernard Drukker, De Brabantia Mars . They are literally playing pots and pans and the result has been a hit in this household for more than a decade. This song reminded me of a cassette tape that I once got from Piet Schreuders. He had played a song in his radio show, Instituut Schreuders, and because I liked that song very much, I asked him how I could obtain it. I could not: it came from a tape with a compilation of tunes that Henri Dagg had made for the BBC in between 1982 and 1989, and it was not for sale. On the copy of the tape that Piet gave me, was an address: Biscuit House, 6 Sandhurst Road, Belfast, BT71PW. I wrote Henri Dagg a letter, asking if I could buy more of his music. He never answered. On the internet all I could find of Henri Dagg was that he has been playing a saw on a festival in 2006. There are 19 tunes on this tape. All the sounds are analog; Henri Dagg worked with tape recorders, not with computers. Some tunes are only a few seconds, but there are also a few longer compositions on the cassette, like this amazing tune called The Kitchen Symphony. If anybody has more information on Henri Dagg and his music, I would love to hear that. Hi! Thanks for the comments; do get in touch.